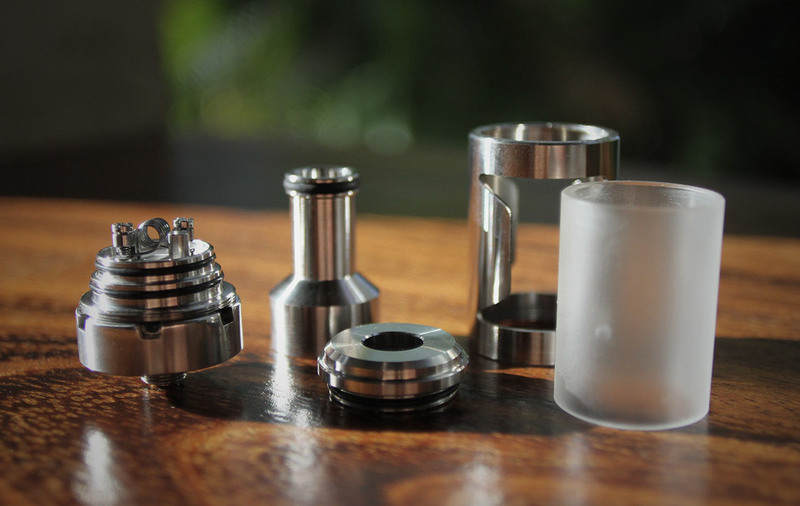 The Immortalizer+ is a notable RDA by Chief Vapers out of the Philippines and when they adapted it into an RTA we had to check it out. This seems to be a new trend, creating attys with multiple mode configurations. But like most things that try to do to much there are usually compromises (Jack of all trades, master of none). There is a lot of hype around this tank, is it all it’s cracked up to be? This is one hard atty to get your hands on. There is no website (well there is one but its a holder page), no easy way to order, it’s Facebook lists pretty much. But before you go on the look out, there are somethings you need to know. We have a Love/Hate thing going on with the Immo Tank, we want to love it but there are some pretty big shortcomings that make it pretty hard. It’s one dope looking tank, it has an almost gladiator helmut thing going on, the materials for the most part are very good, and the flavour is quite good. Were it lacks is the plastic tank section, general fit & finish (janky threads on the out tank sleeve), and overall design thinking. We have to commend Chief Vapers on pushing the limits on design and their are some big wins along with some pretty big loses. Flavour is quite good, it is close to dripper flavour, the chimney section is a little too wide, if it was narrower it would be much better. 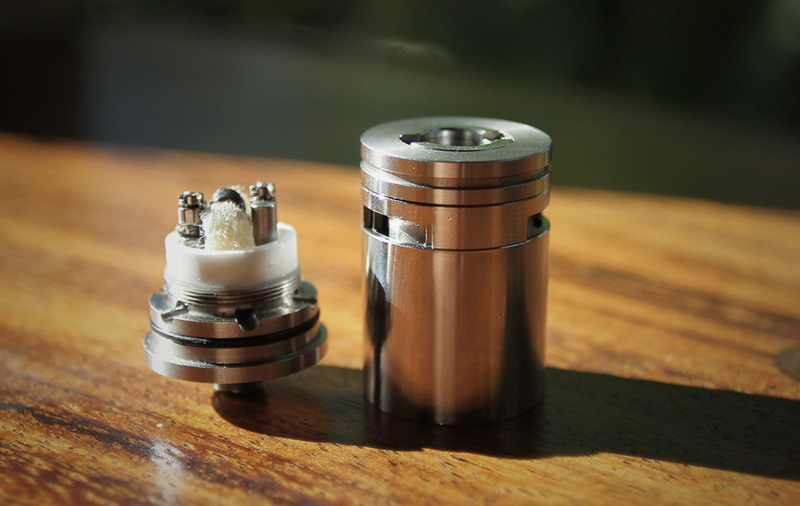 But based on the design this is not possible as the chimney also acts as the direct 510 drip tip connection. Basically the vapor chamber is rather large for a single coil RTA and this causes flavour loss. The ceramic deck insert and under the coil airflow are what is creating the good flavour it has. It’s a clean flavour, almost light while still delivering a wide range of flavour. Airflow is silky smooth and the perfect restricted lung hit. There is no really AFC, the lower ring can partially block airflow but doesn’t really do much. The good news is the airflow is pretty dialled in and most if not all of you will love it. Wicking, wow, this is a big plus. This has to be some of the best wicking we have seen in any tank. The design basically has a perfectly horizontal wick running through the coil, dry hits are virtually impossible. But there is a polarizing effect to this atty’s design, while it wicks super well, this atty tends to leak and is super challenging to refill (we will get into this). The internal pressure can’t handle this wick layout, there isn’t enough back pressure to keep things equalized, and any increased pressure either way causes leaking (like opening the top to refill, or as your wick degrades over time). Building is very simple thanks to the 2 post clamp style posts. It’s a bit trick to align your wire leads under the clamps, but once you get the hang of it, it becomes second nature. 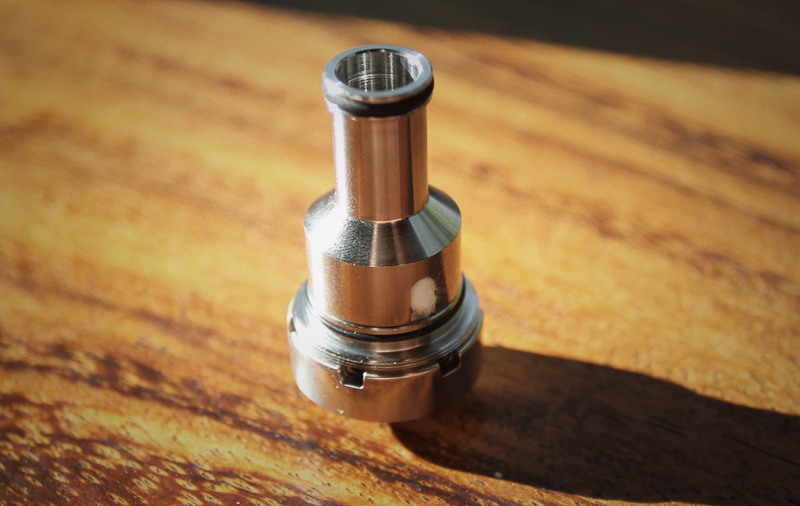 When you receive this atty, most come with a lose positive post, make sure to tighten it down before getting started (seems to only need this adjustment once). The deck will accommodate a 3mm coil and is what we recommend so that you have enough wick to help seal the atty the best you can. 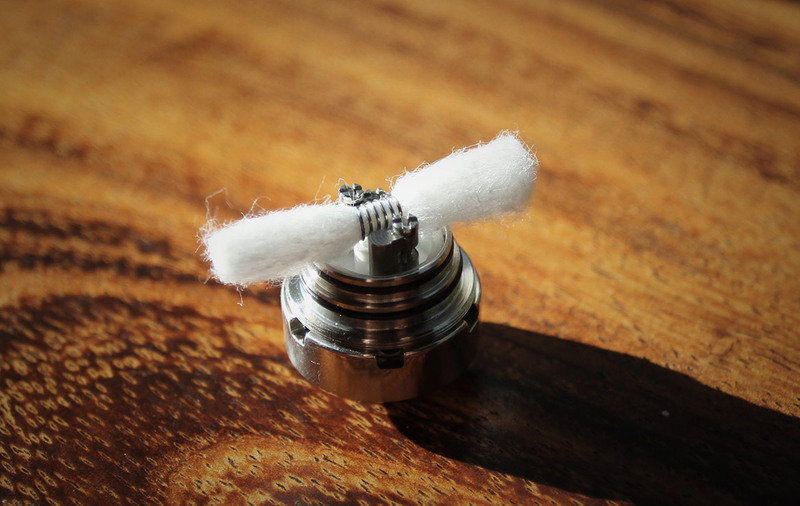 We build a 6 wrap spaced 24 awg coil coming in at 0.5 Ohms and run it between 25-30W. We have notice that the coil seems to stay pretty clean, it has to be the awesome wicking keep the coil pretty juiced up. Placing your wick is a dream, you run it through your coil, place the chimney on top and trim, that’s it and it works every time. Filling (well refilling really, the first fill on a fresh build is flawless), this is one of the biggest flaws. It’s downright stressful (which isn’t cool). It’s like defusing a bomb, the outer sleeve threads are janky (not smooth) and stick a little which causes a major problem (also our sleeve came with major scraping around the bottom portion, a burn mark, and sharp edges on the cutouts). The design is all held together with o-rings, nothing is keeping the chimney in place, so you can twist the chimney by accident if the outer sleeve rubs the inner tank section. If this happens and you don’t notice you will have a major flow session on refill. And again when tightening things back up you have to be just as careful. It causes you to distrust the atty, which is in our opinion a major deal breaker. On top of this issue it can also happen if you don’t keep an eye on your wick condition, as it degrades the seal on the chimney comes into question and will also cause major leaking. We have also noticed a condensation or small leaking happening on the surface of the inner tank section between fills, we haven’t been able to figure this one out. Basically the design is flawed, too many connections (chimney & inner tank) relying on only an o-ring where threads would help. Chief Vapers needs to look at the Hurricane and/or the Ubertoot, both have chimney securing methods that will help improve this design drastically. A reverse threaded bottom on the inner tank would also be a good improvement to stop the conflict with the outer tank sleeve. The actually fill method once you can get it open safely is great, pop the top off and fill. It takes around 2.5-3ml of juice which lasts a decent amount of time. One thing that can help with leaking is never let the juice level get below the top of the vapor chamber, this helps stop any major inner pressure fluctuations. We want to love this tank, it’s a great design effort. 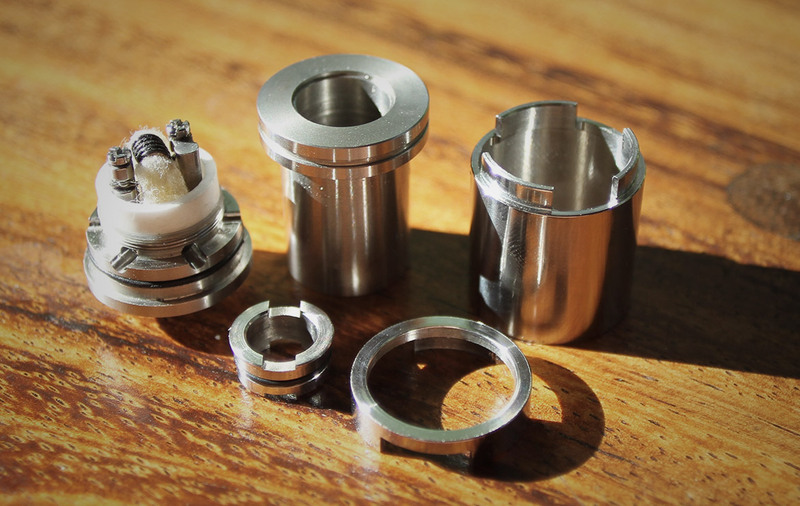 A great idea and way to add longevity to an existing atty. But the flaws are great, we have tried many ways to get the issues to stop but the best we where able to accomplish still had minor tank sweating and small sporadic leaks out the airflow. This tank has a premium price and look that belongs on high-end mods, but when leaking on that precious stab wood becomes an issue, no thanks. The design needs to be revised, sealing the tank and a better method of securing the chimney is a must. The funny thing about this tank is we kept on using it even with the issues, the aesthetic, airflow and flavour are really good, almost worth living with the downfalls… almost. 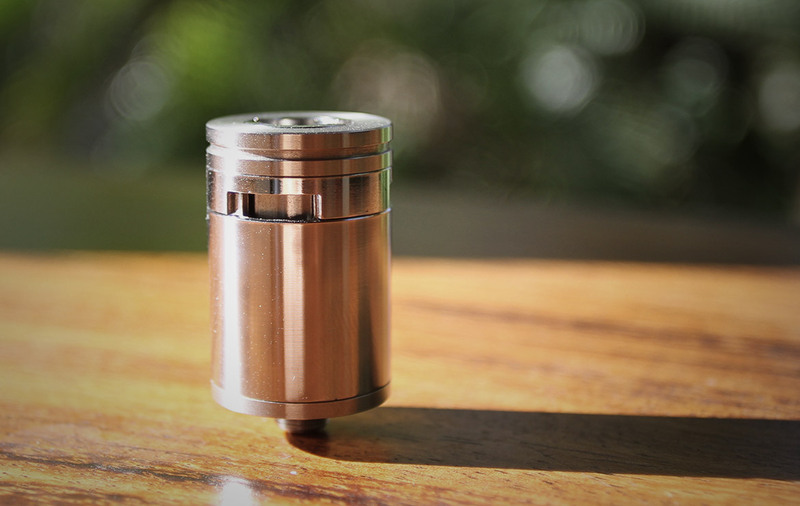 The tank comes with the RDA top section as well(couple pics at the end of the gallery). 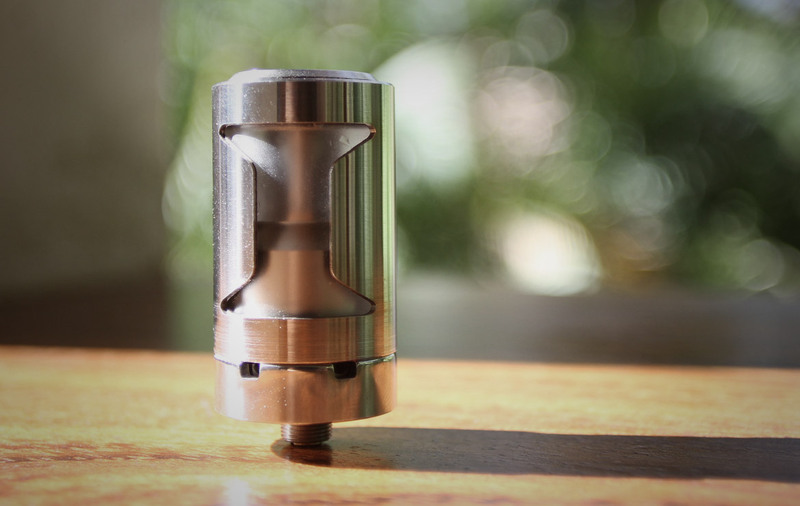 It’s a pretty good RDA, again with some great original design thinking. An inner and outer shelve that act as the AFC and a recycling juice well that makes leaking impossible and over dripping only a issue of a little gurgling for a couple hauls. The flavour is better than the RTA. Chief Vapers is on to something, they are a company to watch for sure, they are very close to having something very special. Sorry, love to help but we don’t know. Reach out to Chief Vapers on Facebook and see what they can do. i tried to clean up the entire screws in the ceramic building deck..unfortunately the small rubber insulator from the 510 pin got washed away..now the reading of my coil is no longer accurate..it always read as LOW RESISTANCE..can this still be fix? Sounds like you should reach out to Chief Vapers and see what they can do for you.